Go West was originally developed by Irving Thalberg in parallel with A Day At The Races. The first outline was logged as early as 15 April 1936 by Bert Kalmar, Harry Ruby and William Slavens McNutt. 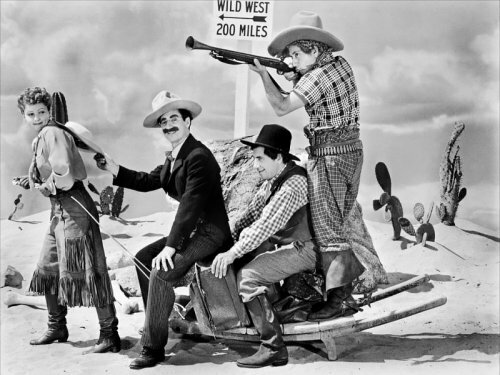 This version had a contemporary setting where the Marx Brothers were entangled with a rodeo, while the basic plot dealt with a map leading to a gold mine. A composite script by Kalmar and Ruby was ready on 19 August 1936, but the project was cancelled when Thalberg died. It is possible that the song Go West, Young Man, written by Bert Kalmar and Harry Ruby and performed by Groucho in Copacabana (his 1947 feature with Carmen Miranda) is a left-over from the original Go West. "May I not have the rather unusual privilege of tending to you, my audience, the warm congratulations which are rightfully yours for the keenness and perspicacity which you have shown in recognizing true genius, accomplished artistry, and monumentomonumania. Thank you." However, in keeping with his silent image, the scene was never shot. The trailer for the film presents an alternate angle where Groucho enters saloon and also features a short close-up that is not in the film, where Groucho says "It's just like a movie". The song As If I Didn't Know, written by Bronislau Kaper & Gus Kahn and sung by the film's romantic lead John Carroll, was recorded for the radio promo and included in the credits but cut before the film was released on 6 December 1940. Two other songs written by Kaper & Kahn for the film, There's a New Moon Over the Old Corral and I Can't Get Along with Horses, weren't used at all.